We believe in the quality of our membership products. So when you purchase our memberships you are covered by a 7 day no risk Guarantee. We will refund your purchase no questions asked if you request a refund within 7 days of purchase. MontessoriHelper now has a full guided curriculum for Age 3 to 6. It allows you to track and monitor your child or student's progress and record observations direct from your login view. 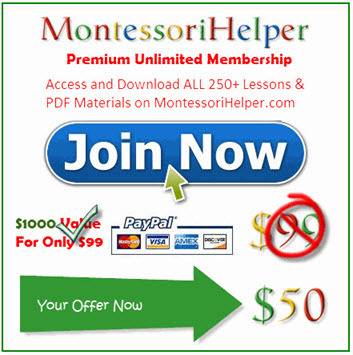 You will love how easy it makes Montessori for you ! How does MontessoriHelper help me ? + Get this Bonus worth $50 for Free ! As an added bonus, all MontessoriHelper Premium Memberships now come included with all the MontessoriHelper Android Apps. The content in these apps is exactly the same as the materials on the website and allows you to abstract learning further to a tablet or mobile phone with ease ! + More Great Bonus's worth $145 for Free ! That’s $145.00 Value Absolutely Free! thanks for this outline.. im working on opening a daycare next year.. this is a big help… thanks andGod bless… im working on a limited budget but i like to believe that Montessori is not for the rich here in Manila. i believe that I can bridge the gap and offer it also to the poor kids…or middle income families as well. thanks again. you are a GOD sent angel to my school.... montessori principles, materials, and a lot of innovative materials towards the use of the montessori program had perfected my idea and assured me that I am towards success. thank you for your great help as your name connotes.